It’s a Birthday Giveaway! Enter to Win GONE ROGUE, exclusive swag, + more! Today is my birthday (confetti and champagne for all! ), and to celebrate… I’m giving away some Books!! And also Other Things! To enter, fill out and submit the Rafflecopter form below. The more connected you and I are on social media, the more chances you have to win! – Five (5) runner-ups will each received a signed copy of WIRES AND NERVE, VOLUME 2: GONE ROGUE, a set of exclusive WIRES AND NERVE nail wraps from Espionage Cosmetics, and an “I Love YA Comics” temporary tattoo from First Second Books. 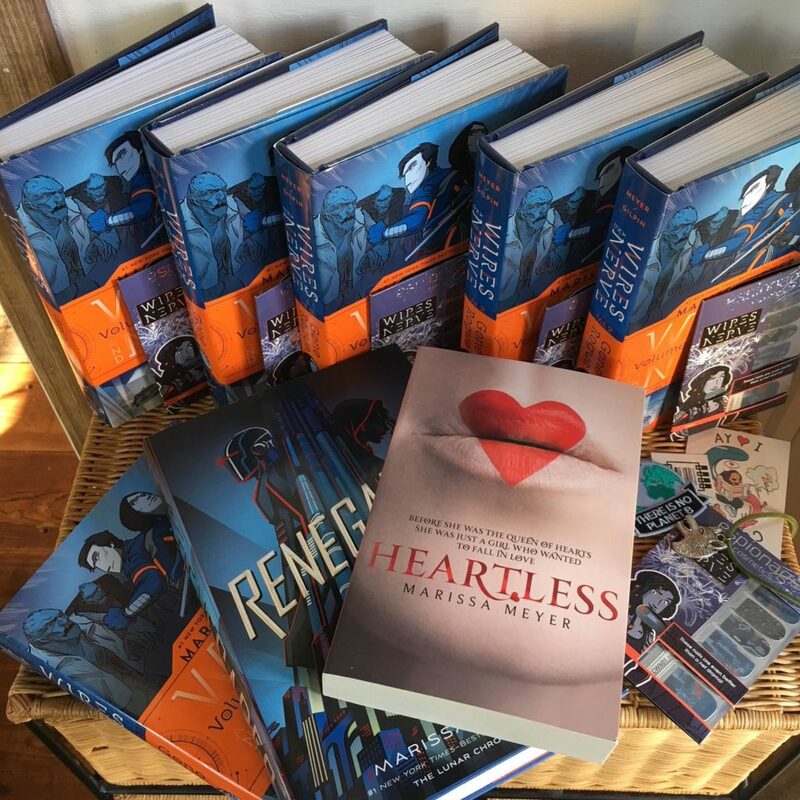 – ONE (1) grand prize winner will receive all of the above prizes PLUS a signed copy of RENEGADES, a signed copy of HEARTLESS (UK, paperback), a decorative patch, and a wolf charm necklace! – Winners will be randomly selected. – Closes to entries midnight PST on Monday, February 26. Winners will be alerted on February 27. Waw! happy birthday! and thank you so much for open the give away worldwide! Happy Birthday and thank you for the amazing opportunity! My fingers are crossed. Happy happy Birthday!! Thank you for your amazing writing!!! And i hope you have an amazing day! Thank you so much for doing this giveaway. I hope you have a very happy birthday! I hope you had a wonderful birthday, and a wonderful day with your kids in the snow. thank you for doing the giveaway. Happy BELATED Birthday Marissa Meyer! I wish you the best belated birthday EVER! hOPE YOU HAD A GREAT DAY! Happy birthday to you, and thanks so much for this amazing opportunity. I’m excited!! Happy belated birthday, and thanks for the great chance! Ahh!!!! It would be so awesome if I won! It’s very hard to create a certified messages in a short time and even have brains full of suggestions to produce unique ones. I need declare that the blogger is a pro author. Here is a light doubt to question – how to produce this kind of awesome content? It has all products what make a good post. There is a getting headings and worthwhile articles. Well done! I need confess that it is 1 of the most fun articles or website posts I have ever study. It actually is also skilfully printed. I’m an British instructor so I see what I suggest. Hi here every girl! It is very cool review. I’m amazed that you are so qualified. I don’t confidence you! Congratulation on composing stunning content! I must say that the review is a high standard text and it matches all kinds of criteria. Well done. Hello. Here is an issue for everybody who try to find excellent excellence articles. Will you seek different website? If you inquire me I will state NO. That website is ideal for myself!